There were a ton of new cover reveals this week, but you know what I’m most excited about? Killer sharks. 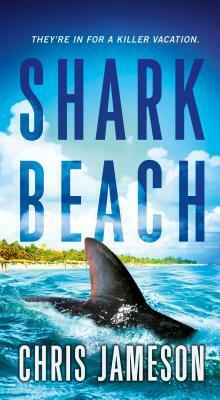 Chris Jameson is coming out with his third shark book, and it’s the kind I would push to the top of my TBR just because I can’t get enough of these guilty pleasure reads. “A dream getaway is about to turn into a living nightmare. . .
Rick and Corinne Scully and their kids have visited Florida’s Captiva Island many times. This year, they’ve brought along their best friends, who can’t wait to finally experience the place the Scullys call Paradise on Earth. Creepy cover!! Sharks terrify me…I have Jaws to thank for that! Lol! Hope you enjoy this one once you get to read it! Same here, sharks terrify me! But I think that’s also why I love reading about them, lol! So excited for this one. Now i need to go find some of those other new covers! I know Queen of Nothing by Holly Black, for one. So excited for that too! Hurricanes, sharks, and shipwrecks? Oh, I am so in! I love the description because it doesn’t mention sharks at all! Lol. Yeah, I guess it’s letting the cover do all the talking, lol! Military research, a storm, and test subjects escaping… plus obviously SHARKS. This looks like an absolute winner. This is a series that just makes me smile whenever I see your reviews and now this WoW post. Not because I’m all chilled about sharks – because they scare me to death – Jaws, the music, just everything. brrr. But, I think I quite like being scared – by a book – I won’t be swimming with any sharks anytime soon – so I’m definitely going to pick up this series at some point. I have to. Oh, this sounds like it could be scary. I’m gonna have to recommend this to one of my friends because she’s obsessed with all things shark! Read these far away from the water, lol! I really need to read these this summer!! Ah yes I’ve already got this one on the wishlist. I love the colours on each of his books. I wasn’t as keen on the last one so I hope this is as good as the first! Same here, I hope this one trends upwards again!